Our first annual Easter Sunday Brunch menu. As savoury dishes we made cheese crackers, bulgur salad, cole slaw, tomato and asparagus quiche, mac'n'cheese, roasted potato halves with cumin and sea salt and an egg salad with coriander and chili. As sweet treats we served chocolate biscotti, lemon squares and a fruit salad. We also had carrot sticks, cherry tomatoes and pickles. 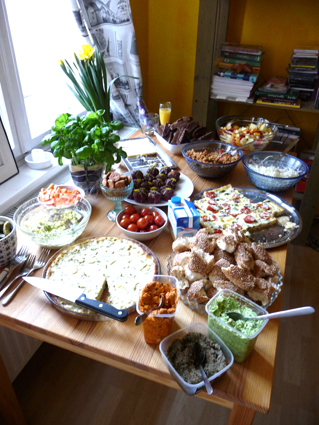 Our guests also contributed with a rhubarb pie, mini choc muffins, Turkish deli spreads and a home made tapenade. As a spring cocktail we served mimosas: we drank altogether eight bottles of sparkling wine with nine litres of orange juice! In fairness there were about 20 of us.